Released by Dan Levitan Music. 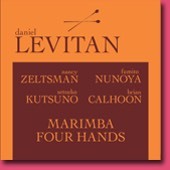 CD & sheet music available from Mostly Marimba. Recorded in 2009 with friends Fumito Nunoya (movements 1 & 5), Setsuko Kutsuno (movement 2) & Brian Calhoon (movement 3).